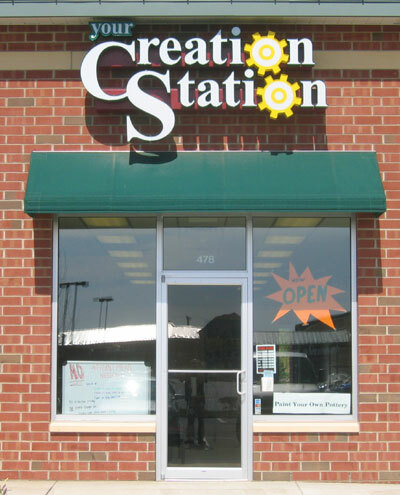 It’s hard to believe this Saturday, September 3 will mark three years since Your Creation Station opened its door for business. It’s even harder to believe this October will be six years since I quit my day job and set out to earn my keep making and selling pottery. I started my pottery as Ryefield Ceramics Inc. and bought my first kiln on Thanksgiving morning 2005. The first year or two were mostly a learning and trying things out time. I developed a unique style, learned about the craft business, showing at art fairs, selling at galleries and did some teaching. In fact, my first two teaching customers were a mental health facility and a day care center. Once a week I go to their site to teach pottery for adults and preschool children respectively. I still teach at both centers, that’s why the store is closed on Mondays. 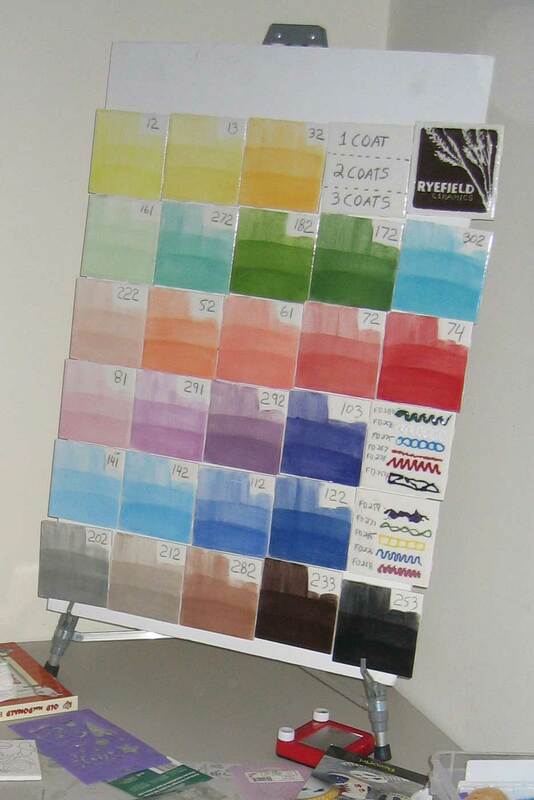 This is what our color chart first looked like. Once things got going full swing, I heard about Middletown Main Street‘s Evening of the Arts (now called Music on Main), through another artist and signed up. Every 3rd Friday in June, July and August, I packed up my truck , came down to Cochran Square, set up a tent but instead of displaying pottery, I put out some tables, unpainted bisque, brushes and an early version of our color tiles. Much like at Your Creation Station, people picked the piece they wanted, painted them and then I glazed and fired it before dropping it off at the La Petite Spa (now Infamous Tattoo Inc) for pick up. By the time the Peach Festival came around that year, I secured two spots and set up the same operation. We were well received. Skipping ahead…it came time to open shop in Middletown Crossing Shopping Center and the store needed a name. While Ryefield Ceramics holds personal meaning for me, it didn’t really convey all the store would offer. Without a doubt, we are all about paint your own pottery here but I knew I wanted it to be more than that. 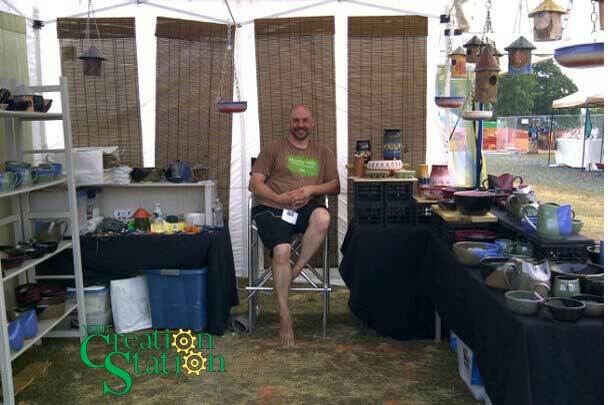 It was to be a place with everything you need to come, relax and express yourself creatively. That’s where Your Creation Station comes from. Skipping ahead again…I was surprised to learn owning a pottery studio leaves very little time for actually making pottery. I still love making pottery and its fun doing craft shows so…about this time last year, I applied for and was accepted to the Brandywine Festival of the Arts and started the wheel spinning again. I was also surprised to learn that people enjoyed painting pieces I’ve made on the pottery wheel or by hand. That led me to start making pieces to paint for the store too. So when your picking out your piece to paint, or see a beautiful piece of pottery online or at an art gallery, you’ll always know it was made in Middletown when you look at the bottom and see Ryefield Ceramics written in the clay.